A few weeks ago we received a call from Anthony, who had something he wanted to show us at his property in Whittlesea. Anthony said he’d perfected a technique involving timber and electricity. Obviously intrigued, we made the trip out to his place. Anthony has figured out how to decorate timber using nothing but 10,000 volts of electricity. As we listen to Anthony explain his process, he taps two electrodes into either end of a beautiful slab of Australian Redgum he had milled himself from trees on his property. He then wets down the surface of the timber with a specific mix of ingredients he has formulated through a long process of trial and error (we asked what it was, but it’s a trade secret of course). We’re then asked to stand back, and Anthony plugs it in. Jesse and I watch as actual pure electricity, slowly creeps its way across the surface of the timber. 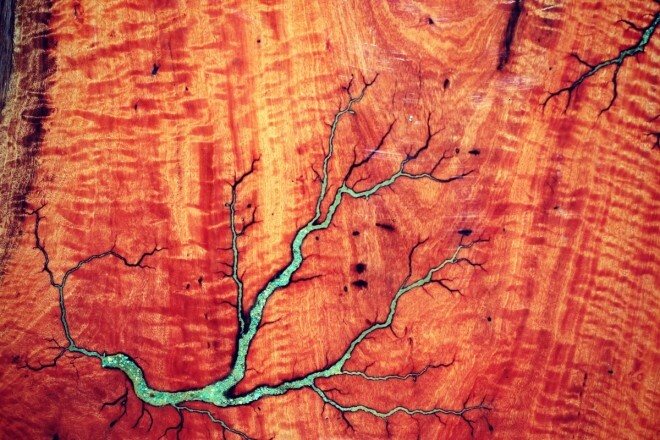 It’s a beautiful and mesmerizing thing seeing the little lightning bolts burn organic “Lichtenberg” patterns into the timber as they cross the surface trying to connect to each other via the path of least resistance. The pattern that’s left can then be filled with resin, or crushed minerals and then sanded and polished to create a stunning tabletop or piece of feature timber. Each pattern is completely unique and different shapes result from different placements of electrodes, different timbers and other variables. Needless to say, we were pretty amazed by the whole process, and excited by the possibilities for decorating furniture that this would allow. Thanks Anthony for inviting us out to see this. Anthony is now offering his services, through his business Thunderstruck Industries, to anyone who’s interested. He can make you a stunning custom timber slab table top that you won’t be able to find anywhere else (he’s the only person that can do this technique). And he’s open to all ideas for using this new process he’s developed.